I have an agent. I wrote a novel that sold to a Big 5 publisher. I belong to two writing critique groups, and I live in Brooklyn. Yet when one of my newer writing critique group members asked me if I’d been to any residencies — not in a judging way, but in a friendly, encouraging tone — I froze, as if this were a trick question; a veiled insult; a failure of tact. But only people like you go to those, I thought but could not say. Real writers. Not only have I not gone to one; it would never occur to me to apply! Not that I wouldn’t want to — just like I’d like to go horse trekking in Mongolia. Equally dreamy, equally improbable. But later I started to think over this exchange, and to wonder. What would it take for me, like the Velveteen Rabbit, to become real? What does it take for anyone? 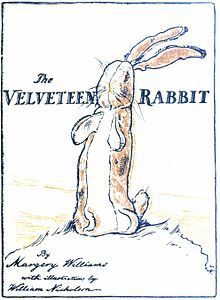 “The Velveteen Rabbit” is a children’s book I somehow missed as a child. Coming to it as an adult, unprotected by naiveté, when you realize how hokey it is and are moved to tears every time you read it anyway by the blunt force of its central metaphor, is humbling and unsettling in the best way. To be real means to be alive, to be human (or rabbit), and vulnerable, no longer cozied in the warm plush of the hypothetical. Maybe if I had a cover, I thought. That would seem sort of real. But then my editor sent some prototypes, and I liked one, which happened to be the same one she liked, so maybe there will be a real (that word again) cover soon. Maybe if I had an audio book. Maybe if the UK rights sold. Maybe my Twitter followers exceeded three figures. Maybe if I ever earned out my advance. Maybe if I wrote another novel. What I realized that day is that I could win the Man Booker Prize and I still would feel like something was missing. There is no cure for this pain; it is part of the condition of being human (or rabbit). The only thing that is actually helpful is the work itself, and I could do worse than get back to doing some. Elisa Albert has put it much better than I possibly could here, though I recognize the irony of even making that comparison. Next > Happy Birthday, Jane Austen! I wish I could be like you onr day, but alas, I know it will never happen.